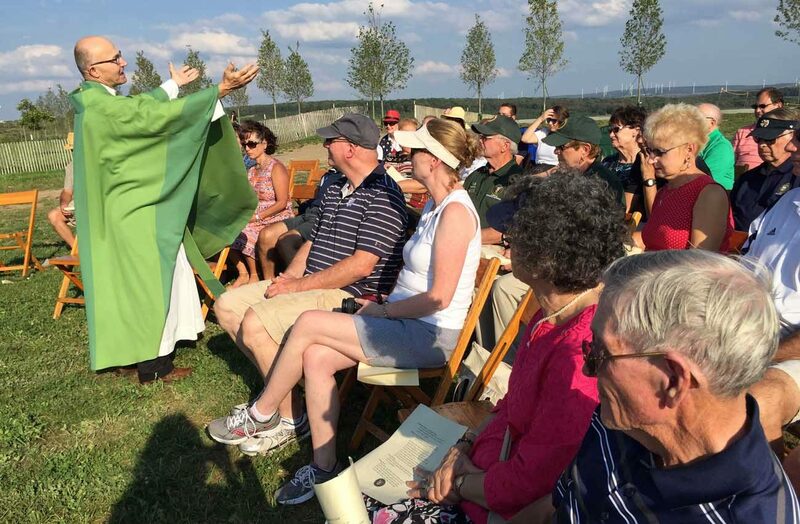 SOMERSET COUNTY, Pa. (CNS) — Fifteen years after United Flight 93 crashed in an open field in southern Pennsylvania, a small group of Catholics quietly gathered in the stillness of the site to remember the people who sacrificed their lives so that others might live. Msgr. 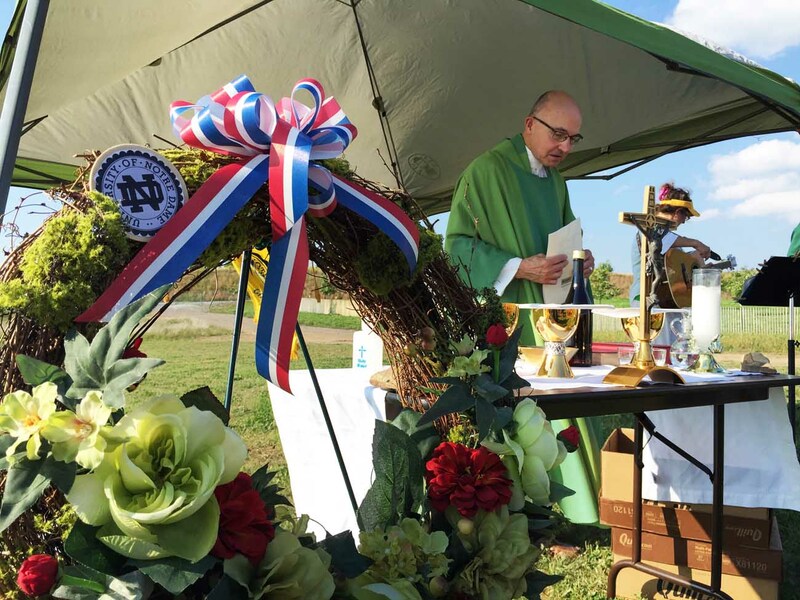 Roger A. Statnick, pastor of St. Sebastian Parish in Belle Vernon, and a board member of the Notre Dame Club of Greensburg/Uniontown, celebrated an outdoor Mass of remembrance on a hill above the crash site for nearly 30 fellow club members at the Flight 93 National Memorial Sept. 10, the eve of the anniversary. Four commercial airliners were commandeered the morning of Sept. 11, 2001, by al-Qaida-linked terrorists in a calculated attack against the U.S. Two planes were flown into the World Trade Center’s twin towers in New York City; a third flew into the Pentagon outside of Washington; and the fourth, Flight 93, went down in Somerset County. That flight, which departed from Newark, N.J., had been bound for San Francisco when four men took over the plane and diverted it toward Washington. Because of a delay in its departure, the 40 passengers and crew on board had learned through cellphone calls about the other incidents and determined that their plane was part of the planned attack. The calls as well as the cockpit voice recorder recovered from the crash site revealed that passengers and crew made a collective decision to rush the terrorists to retake control of the plane. At 10:03 a.m., the plane crashed upside down at 563 miles per hour killing all on board. The plane was 18 minutes from Washington. Msgr. Statnick drew from the story of the prodigal son in the day’s Gospel reading during the Mass. He noted the older and younger son were alike “because they were both concerned about themselves” and also were motivated by fear. Likewise, “it is our fear that we may not be taken care of,” Msgr. Statnick said. “(This is) the gift that was given to our nation by these 40 people,” Msgr. Statnick said. “Whether or not they were Christian, we see the spirit of God acting in their sacrifice. Prayers of the faithful were offered for all the men and women who perished at the site on 9/11 and for their families to find peace and consolation. An offering basket with the names of each of the 40 passengers and crew was passed among Massgoers, who took one name with the intention of praying for the individual and the loved ones left behind. “This place fills our hearts with sadness, but Christ’s spirit fills us with hope,” Msgr. Statnick said. As attendees softly sang, “Jesus, remember me when you come into your kingdom,” Msgr. Statnick blessed a wreath in remembrance of the victims and placed it on the hillside overlooking the impact site — marked by a large boulder — and debris field. The fields and wooded area beyond are the final resting place of the passengers and crew. Joe Herbert, a member of St. Vincent Basilica Parish in Latrobe, Pennsylvania, and vice president of the Greensburg/Uniontown club, said members gathered not to dwell on the evil and hatred that was perpetuated on 9/11 but to honor and celebrate the 40 men and women who expressed the greatest love for others. “They gave their lives for their family, friends, and nation,” he said. Fazzini is managing editor of The Catholic Accent, newspaper of the Diocese of Greensburg, Pennsylvania.